For those of you that have been following me on Snapchat (@frilltho) you know that I’ve been contemplating coloring my own hair for a couple of weeks now. It’s the ultimate dilemma; do you pay a fortune to know it will turn out right. or do you try it yourself but risk turning your hair orange? I have to say, I think it turned out great! Why don’t you take a look for yourself and let me know!? ^^ I was able to get a small packet in store for much cheaper. Thanks for watching! I plan on doing more vlogs soon! OMG! Congrats! Your video turned out so nice! Love the new hair color! Stunning, babe! so brave but great, thanks for sharing! Love this! I don't think I could go fully blonde but I am so happy you have more guts than me! Looks so beautiful on you! I don't think I would have the same effect! Happy Monday! Your hair came out awesome, and you look fabulous as a blonde and a brunette! You look beautiful in any hair color. Love that you made a tutorial. I know that I've done hair coloring at home and for me I always end up with a reddish tint. You did a fab job. You look great! I wish my hair looked half as great as your's does. your hair looks great! I am just too scared to do mine at home 🙁 I totally wish I could because I am so tired of that price tag of getting it done! You have gorgeous hair!! Such a great tutorial. Your hair looks SO cute!! Oh my goodness! Your hair looks amazing! Congratulations on your first tutorial!!! Your hair looks amazing, you did such a good job! You look amazing in both colors but really loving the blonde! Your video is awesome!! Your hair looks stunning! You're pretty brave for trying at-home color! I love the carmel tones! Your hair looks awesome! Definitely looks like it was done my a professional salon! Your hair looks amazing. Brown to blonde is difficult but you did it. I'm really impressed you did this yourself. Love the idea of doing it yourself, it looks gorgeous on you too! Anything to ball on a budget for mexico! what a fun tutorial, your hair is amazing! I wish I was that brave, but I really don't do much with my hair! Wow your hair looks amazing! I'm always so scared to do my hair at home because i think it doesn't come at as well, but your hair definitely blows that out of the water. What a great idea for a video tutorial! 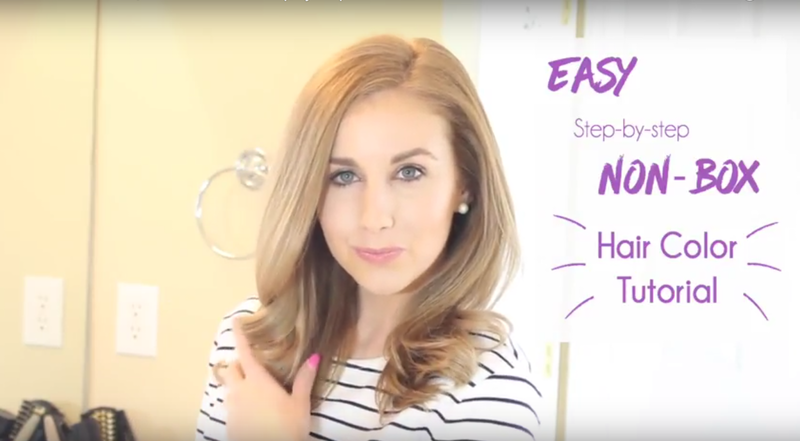 I used to color my hair at home all the time, and would have totally benefited from this! And your hair looks fabulous, great job.